Fox will make a lot of matinee fans happy with Tyrone Power: The Swashbuckler Box Set, a collection of five of Power's most exciting pictures. The list includes one bona fide classic, an underappreciated epic and two more ambitious period swashbucklers. 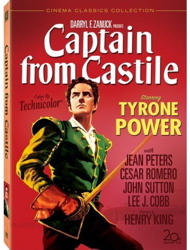 Fans tend to love Tyrone Power and the most notable 'swashbuckler' Errol Flynn for different reasons. Superstar Flynn is almost too dynamic for his movies, many of which are simply extravagant vehicles for his outsized talents. Tyrone Power is less of a superman figure and his characters are often subordinated to strong stories, which makes sense considering that many of them were personally produced by Darryl Zanuck. But even when Power's pictures fall short of perfection, they tend to be both intelligent and distinctive. The set includes Captain from Castile, a superb epic ripe for rediscovery. 1941's Blood and Sand is a bullfighting film, not a swashbuckler per se. Vicente Blasco Ibáñez' novel is something of a Spanish national epic with its story of the rise and precipitous fall of Juan Gallardo, a famous matador. It has everything: an ambitious poor boy who wants to win back his father's good name; a faithful wife (Linda Darnell), a faithless lover (Rita Hayworth) and a worn old mother (Nazimova) who foresees that her son will meet the same cruel fate as his father. Blood and Sand is an old story exceedingly well written for the screen by Jo Swerling. Juan seeks fame and honor but never learns to read or write. His faithful retainers (John Carradine, J. Carrol Naish, Pedro de Cordoba) eventually desert him as he becomes more arrogant and irresponsible. As the debts mount, freeloading relatives like Juan's sister Encarnacíon (Lynn Bari) attack his good name. It's even lonelier at the top thanks to the pompous, predatory critic Natalio Curio (Laird Cregar). Curio feeds off the young matador's fame and then pretends that Juan's success is his doing. It's a rather accurate picture of the dishonest critic. Tyrone Power shows in Blood and Sand that he can handle serious dramatic roles. Linda Darnell is fresh from The Mark of Zorro and Rita Hayworth is perfect as the Spanish temptress Doña Sol des Muire. She's quite a sight when dancing with Anthony Quinn, who plays a competitor in the bullring. But Ray Rennahan's artful Technicolor cinematography probably distracted viewers from the performances. Director Rouben Mamoulian was always a pioneer in technical matters, and Blood and Sand is a showcase of interesting effects in the 3-strip process. Carmen's white wedding dress contrasts strongly with Doña Sol's alluring gowns. Mamoulian has Hayworth open a dark wrap, exposing a bright dress that lights up the screen like a matador's cape -- a trick used later by Vicente Minnelli in The Band Wagon. Under the Technicolor lights, Power's ornate matador outfits also take on magical hues. 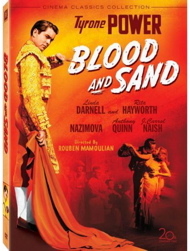 Blood and Sand retains Ibáñez' fixation on bullfighting as Fate, with the measure of a man determined by how he faces the possibility of death in the afternoon. Mamoulian stages two impressive scenes in the arena but leaves Juan's final confrontation mostly off-screen. By that time Juan has lost all of his friends, even John Carradine's Nacional, a socialist forever swearing to quit the corrupt blood sport. The old matador played by J. Carroll Naish curses not the bulls, but the bloodlust of the crowd that gathers for the ritual slaughter. Fox's Blood and Sand has received a lucky break from the gods of video restoration. The clear image closely approximates the look of original Technicolor prints, with contrast ranging from inky blacks to the bright gleam in Rita Hayworth's eyes. Perhaps this Oscar winner for Cinematography received special treatment when labs were converting Tech films to normal Eastmancolor. The soundtrack features Alfred Newman's standard score and some great flamenco music. I presume that Ms. Hayworth's singing voice is dubbed, but she sounds very good. Besides a photo gallery the main extra on Blood and Sand is a commentary by a director of photography, Richard Crudo. He devotes his track to camera-related issues, talks a bit about the Technicolor process and tends to drift onto tangential topics. The way to really learn about Technicolor on DVD is still Turner's fine documentary Glorious Technicolor, included on the special edition disc of The Adventures of Robin Hood. Blood and Sand is considered a textbook film when studying what Technicolor can and cannot do. Made right at the outbreak of WW2, Son of Fury, the Story of Benjamin Blake is a fine example of Power as the archtype conceived by Darryl Zanuck: a disinherited nobleman fighting to regain his good name and fortune. The surprise is that Philip Dunne's good writing and John Cromwell's assured direction make this formula seem fresh once again. Young Benjamin Blake (Master Roddy McDowall as a child) is the unrecognized son of the Blake family. Unscrupulous uncle Sir Arthur (George Sanders) takes Ben on as a bonded stable boy to ensure that he can never claim his noble title. As an adult, Benjamin woos Sir Arthur's daughter Isabel (Frances Farmer) and is accused by his uncle of assault, a hanging offense. With the help of a bar girl (Elsa Lanchester) Benjamin escapes to the South Seas, jumps ship with another bitter convict (John Carradine) and lives happily among the Polynesians, harvesting pearls and romancing an island girl that he names Eve (Gene Tierney). Benjamin returns to London with a fortune in pearls and engages lawyer Bartholomew Pratt (Dudley Digges) to recover his title and clear up his legal problem, so he can marry Isabel. Blake is instead arrested; when asked, Pratt disavows any knowledge of him. The unpretentious Son of Fury is another undeservedly ignored gem. Unlike most swashbuckling heroes, Blake is not invincible. He loses several fistfights and is clubbed for talking back to the Captain of a sailing ship, who goes right on calmly giving instructions to his crew. Blake consistently puts his trust in others, a policy that pays off only 50% of the time. Darryl Zanuck assembles a quality cast. Elsa Lanchester's good time girl is overjoyed at being treated like a lady by Blake's thoughtful gentleman. John Carradine is a terrific hardened criminal who finds peace and happiness in a South Seas paradise. As Carradine frequently plays villains, Son of Fury seems like a personal reprieve -- it's a joy to see him smile. The high-profile barrister Dudley Digges gets two entire scenes almost to himself. Harry Davenport is Blake's maternal grandfather, who is thrown into prison when Benjamin flees the country. George Sanders must have loved playing S.O.B. 's, because his dastardly aristocrat is a real stinker. The marvelous Frances Farmer (Come and Get It) dresses up the first part of the picture with her wonderful smile and ambiguous affection for Blake. Also making sparks with Power is Gene Tierney as a Hollywood Polynesian complete with the full Max Factor treatment. She's a vision, and a major impetus for Blake to find a higher value than simply taking his uncle's place in the House of Lords. Son of Fury generates a good feeling about its characters and ends with a romantic reunion on the beach that leaves us feeling exhilarated. When Powers kissed 'em, they apparently stayed kissed. Son of Fury is in fine shape, giving us John Cromwell's classy masked ball and the studio-bound Polynesian beaches in their original B&W glory. The Alfred Newman score has been isolated, the kind of extra that studios can give us any time, with thanks. The new featurette is an overview of the middle section of Tyrone Power's career, and is the best of the group of short subjects on these discs. Still & advertising galleries and a trailer are included as well. 1948's The Captain from Castile is this collection's real dazzler. I wouldn't be surprised if the handlers and agents of Hollywood's top ten male stars see this disc in the next few weeks and propose a remake as a perfect vehicle for their clients. Castile makes Power the central character in nothing less than the Conquest of Mexico and paints a refreshingly non- PC view of La Conquista. Driven from his home by The Inquisition, Pedro de Vargas (Power) heads for Santo Domingo with rogue friends Lee J. Cobb and Jean Peters (in her first movie). There he hooks up with the near-piratical gold-hungry expedition of Hernán Cortez. This is probably the best role ever played by Cesar Romero; his Cortez hijacks the expedition from its lawful leaders and by charisma alone aims straight for Moctezuma's fabled City of Gold. Aztec interpreter Doña Marina gives Cortez a linguistic advantage over Montezuma's advance guards and ambassadors, enabling him to bluff, bribe and smile his way toward the capitol. Curiously, the expected armed conflicts take place mostly off screen while we concentrate on Pedro's romance with Catana, the Jean Peters character. In what looks like some compromised restructuring, Pedro is gravely wounded in two redundant incidents, while we never see the battles with Moctezuma's armies. This is perhaps the only film to capture the full spirit of the Spanish conquest. The Conquistadores may be ruthless opportunists but they also have the sheer guts to risk all in a wild quest. Life is short and death can come from almost anything, even a bellyache. Why not go for the big prizes of honor and riches as well as the blessings of God and country? Cortez laughs as he burns his own ships, forcing his men to trust in his grandiose promises of glory. One man's personality motivates an entire army. The film provides a complex look at class differences and the role of Spain's corrupt Inquisitors. The handling of the Inquisition raises parallels with the American blacklist, but Captain from Castile is a couple of years too soon to have been inspired by the happenings at HUAC. Some viewers may also be surprised that the show does not portray the Aztecs as innocent victims. Cortez successfully conquered a nation that could easily have annihilated him, had it not been intimidated by his horses and his utter self-confidence. The film benefits from terrific Mexican location work to evoke both Spain and the New World. The costumes and sets are superb; all that is lacking for the modern viewer are elaborate battle scenes. The ending will surprise some, as the story reaches its climax just as the wonders of victory lie before the conquerors, in a vision of a city floating on a lake. A real volcano is seen erupting behind many grand shots of marching armies -- no mattes, no fakery. Finally, Alfred Newman's score is one of the best Hollywood ever turned out. A weird theme accompanies the Jean Peters character, a choice that's difficult to understand. The exultant Spanish march cue makes one want to jump in the saddle and cabalgar alongside Power and Romero; in 1954 the USC marching band adopted it as the school's official tune. John Sutton is the hissable villain, Antonio Moreno is Pablo's noble father and Barbara Lawrence (Kronos) is Luisa, a high-toned Castilian girlfriend. When Pablo is sought by the inquisition, Luisa's reaction is to fret that she might be implicated should they find her handkerchief on him. Other notable faces include Alan Mowbray, Thomas Gomez, Marc Lawrence, Jay Silverheels, Chris-Pin Martin and Estela Inda as Doña Marina, Cortez's interpreter and paramour. Captain from Castile's very good transfer almost captures the original's Technicolor luster. It has no real flaws but the colors in some scenes are on the weak side. A chatty commentary combines critic Rudy Behlmer and music expert Jon Burlingame with moderator Nick Redman; they discuss all of the actors as well as the film's status as one of the biggest productions of its day. The entire Alfred Newman score is provided on its own track, synchronized with cue IDs and conductor comments intact. Audio tracks in French and Spanish are provided but the Spanish track sampled appeared to make use of a different music score. An interview featurette gathers Patricia Neal, Colleen Gray, Terry Moore and Jayne Meadows to comment about their co-star. It soon bogs down in repetitious talk of how handsome and nice Power was. A B&W trailer and still & art galleries finish the package. Prince of Foxes is yet another intelligent costume drama, one almost too intelligent for American audiences of the time. Power begins the show as Andrea Orsini, an unscrupulous opportunist doing dirty jobs for Cesare Borgia (Orson Welles, in fine form and perhaps at a decent weight for the last time). Acting as an emissary, Orsini paves the way for Borgia to annex a neighboring petty kingdom, using flattery and well-timed bribes. Then Cesare dispatches Andrea to murder Count Verano (Felix Aylmer), woo his wife Camila (Wanda Hendrix, yet another interesting romantic foil for Power) and take their city fortress Cittá del Monte. Orsini is instead redeemed by Camila's fidelity to her husband, and changes sides to defy Borgia's mercenary armies. Orsini's only ally is Mario Belli (Everett Sloane), an assassin with the unmistakable face of a complete knave. The big twist is that Andrea is actually a complete imposter; his mother is a poor peasant named Costanza (Katina Paxinou). Orsini's conversion to the side of goodness is well motivated. His defenders at Cittá del Monte can hold out against Borgia's armies only for so long, leaving him with the bitter choice is to flee or die defending a woman he's never possessed. The utter ruthlessness of Welles' Borgia is a major delight; when Cesare and Belli chortle over each other's craven villainy, we can't help but be moved. Everett Sloane gets what may be 1949's most sadistic scene: at a fancy dinner, the assassin Belii offers to gouge a man's eyes out with his thumbs, and Camila is forced to watch. Contributing heavily to director Henry King's success are the authentic locations in Italy. When we see a castle on a hill in this movie, it's the real deal. Most of the castle interiors also look authentic, enhancing the film's special atmosphere. The majority of the supporting characters are Italians but familiar Italian-American Eduardo Ciannelii has a nice bit, along with Mexican looker Ariadna Welter, later of The Brainiac and The Devil's Hand, which starred Tyrone Powers' second wife, Linda Christian. 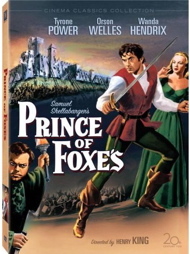 As many viewers have said, if Prince of Foxes were in color, it would probably be considered a classic. The print of Prince of Foxes is in great shape, showing off Leon Shamroy's fine B&W cinematography. Alfred Newman's music score is isolated on a second audio track. Besides the expected trailer and photo galleries, the disc offers a Movietone newsreel of Tyrone Power and Linda Christian's Italian wedding ceremony, which took place right after the completion of filming. The newest show in the package is 1950's The Black Rose from Thomas B. Costain, the author of The Silver Chalice. This costume picture ranges from England to China during the Crusades and was photographed in Technicolor by the great Jack Cardiff. Power is fine as Walter of Gurnie, a de-classed Saxon who prefers to seek his fortune in the Orient rather than serve a Norman king. Henry Hathaway directs, well enough to surmount some odd script transitions. The rousing story engages a lively cast. James Robertson Justice is a man of letters, Finlay Currie is Walter's gruff grandfather and a young Laurence Harvey is Walter's mean-spirited half-brother. Michael Rennie is the fair-minded King Edward; this may be the role that landed Rennie the career-altering part of Klaatu in The Day the Earth Stood Still. But the film's brightest supporting performance is by Jack Hawkins as Tristram Griffin, a longbow-wielding sidekick who earns equal status with Power in all but the romance department. On the way to the Far East the adventurers meet a wild mix of character actors. From The Treasure of the Sierra Madre are Alfonso Bedoya as a caravan boss and Robert "Bobby" Blake as a servant boy. Peter Sellers reportedly dubbed a rather weird voice for Bedoya. The presence of these two actors makes us think that The Black Rose's Persian and Chinese desert vistas may have been filmed in Southern California. Herbert Lom is the caravan's owner; but his angles may have been filmed in England separate from the surrounding material. The film manages a charming love story. The pixie-ish Cécile Aubrey, fresh from H.G. Clouzot's Manon is Maryam, a half-Persian half-English waif being shipped by caravan as a concubine for the Kubla Khan. Maryam masquerades as a second helper boy. She slowly wins Walter over to her girlish dream -- of marrying a handsome English knight and returning with him to England. It's all handled charmingly. Meanwhile, Walter and Tris have to contend with an imposing Persian general, Bayan of the Hundred Eyes. Orson Welles plays this barbarian with his usual bombast and hauteur and befriends the two adventurers. Welles is already much heavier than in his previous year's Prince of Foxes. When Tristram demonstrates his skill with his longbow "Sarah", Walter decides not to tell the archer that if he misses, Bayan will have his head bashed in. The two friends break up in Cathay after becoming disillusioned by Bayan's war strategy: the general orders his troops to murder thousands of Chinese. Walter and Tris are then captured by the Dowager Empress and locked in a lavish pavilion; she believes that they're magic bird-gods sent from heaven to cast a spell of peace blocking Bayan's onslaught. When the war continues, the future doesn't look good for our heroes and Maryam. But Tris still has his longbow and Walter has been learning about the Chinese secret weapon called gunpowder. 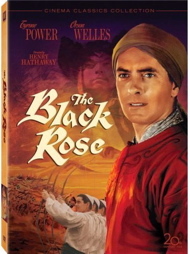 The Black Rose is a fine movie but the disc looks drab compared to old Technicolor prints that sported the magical color contrasts of other films by cameraman Jack Cardiff, like Black Narcissus. It's nobody's fault, unless one expects Fox to commit a multi-million dollar restoration to a film with few commercial prospects. On small monitors the image will look fine but on a projection TV the show is muddy and colors aren't as attractive as they might be. The film's many matte shots also fare poorly; the entire trip from Arabia to the Great Wall of China seems to be accomplished in front of a painter's canvas, with a little smoke thrown in. Luckily, the close-ups of Power and Cécile Aubrey look fine, and in this adventure the characters carry the story. The Black Rose has a featurette called Tyrone Power: Family Reunion that gathers relatives like Tyrone Power IV, Taryn Power and Linda Christian on a sofa to discuss the actor's career. It's slow going once we've figured out who's who. An interactive pressbook is rather complicated to access; a still gallery and trailer are also present. 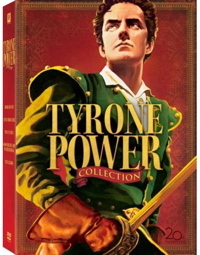 The Tyrone Power: Swashbuckler Box Set celebrates an enormously popular star never afforded much industry respect for his superior acting. Fox has transferred the films as carefully as possible, with only The Black Rose verging on inadequate in the image department. Each slim-cased disc contains an envelope with little collectable postcard - sized stills. The slipcover is a bit on the flimsy side but displays great artwork, as do the individual discs. Movie: B&S: Excellent, SoF: Excellent, CFC: Excellent, PoF: Excellent, TBR: Excellent. Sound: B&S: Excellent, SoF:Excellent , CFC: Excellent, PoF: Excellent, TBR: Excellent. Supplements: 3 Featurettes, two commentaries, still and artwork galleries, 4 trailers, printed 'lobby card' stills.